Policy Insights, the Budget Center’s annual conference, is the premier event for advocates, policymakers, researchers, funders, service providers, and other leaders working to improve the lives of low- and middle-income Californians. The conference fosters a discussion on expanding economic opportunity for all Californians. 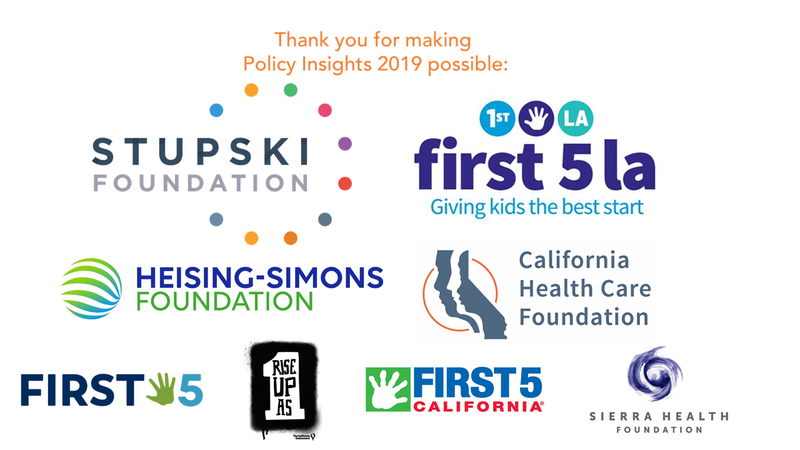 The following is the agenda and schedule for Policy Insights 2019, which was held on March 27 at the Sheraton Grand Sacramento Hotel and attended by over 400 people from around the state. This page includes links to presentations and handouts from the conference sessions as noted. A conversation with Governor Gavin Newsom’s Cabinet Secretary about the Administration’s proposed 2019-20 budget, “California For All” policies, and priorities for California in 2019-20 and beyond. The Senate Pro Tem, Chair of the Senate Budget Committee, and California’s new Legislative Analyst discuss current state budget and policy proposals and opportunities for progress in this year’s budget deliberations. One of California’s, and the nation’s, most innovative leaders discusses his efforts to redefine the role of his city in creating broadly shared economic opportunity for the people of his community. In recent years, California has substantially reformed its criminal justice policies to reduce incarceration and promote more effective pathways to rehabilitation. Yet, even with these advances, Californians who have completed their sentences continue to face systemic barriers – such as restrictions on access to jobs and housing – that hinder their ability to rebuild their lives. While some people can clear or change their records, this process is cumbersome – and, in California, old convictions can never truly be erased. This workshop will review recent efforts to reduce the collateral consequences of old criminal convictions as well as highlight additional policies that can remove the legal roadblocks that prevent millions of Californians from realizing their full potential even after they have paid their debt to society. Many state tax policies currently have the effect of exacerbating racial income and wealth inequality, making it harder for people of color to share in California’s prosperity. The state tax code can also be used as a tool to reduce economic and racial disparities while raising revenue to support services and investments that provide more opportunities for communities of color to achieve economic security and build wealth. This workshop will explore the many ways in which tax policy contributes to the widening of the racial wealth divide as well as policies California can pursue to make the tax code more equitable. In order to drive powerful progress toward policies that advance racial and gender equity, we must take intentional steps ─ starting with how we communicate and talk about these issues. In this workshop, you will learn strategies from key leaders in some of the most exciting and important movements in California. The 2018 elections saw a record number of women candidates in California elected to the state legislature, statewide office, and the US Congress. Across California and the nation, women were energized and activated to run for elected office, many of them for the first time. We are delighted and honored to be joined at this year’s conference by several of California’s newly elected state legislators who will share their motivations for running for office, their experiences so far, and their policy aspirations for California and their communities. Housing is the largest expense in most families’ budgets for basic needs, and unaffordable housing costs are a critical driver of California’s high poverty rate under the Supplemental Poverty Measure. But housing also matters beyond its role as a major household expense. Housing quality, stability, and location can all significantly influence an individual’s health, well-being, and educational and economic opportunities. This workshop will explore the many ways that housing affects life outcomes, over the short term and long term. We will also discuss how housing policies can be used as tools to promote well-being and increase equity in opportunity for all Californians. Wealth is central to economic security and mobility. It allows families to weather financial setbacks, save for a rainy day or retirement, invest in a home or a business, or even to boost the financial security of their children. However, people of color and women face persistent barriers to building wealth. This workshop illuminates the pressing racial and gender wealth gap, discusses how public policy has helped create these inequities, and lays out a better set of policies that could put California and the nation as a whole on a better path to building wealth for millions of families. Education data is a powerful tool that can help policymakers, educators, parents, and other stakeholders make informed decisions, but California lacks an integrated data system found in other states across the country. Sixteen states currently have a data system that track students from preschool through a college degree and into the workforce. Could Governor Newsom’s proposal to support a statewide longitudinal data system add California to this list? This panel will explore the benefits of, and some of the obstacles to, bringing a transparent “cradle to career” data system to fruition in a large and diverse state.